Welcome to the fourth day of the National Transplant Week instalments, I hope this week is providing you with a lot of important information and insight into the importance of becoming an organ donor in the UK. Kirstie Tancock lives her life like any other 24 year old, she has a husband, a dog, a house, career ambitions and dreams. Little would you know that Kirstie has undertaken two lungs transplants in her life so far, recently celebrating 2 years since having her second transplant. Kirstie Tancock now spends her life undertaking fitness pole training, doing public speaking and taking up body painting whilst also focusing on the life she spends with her friends and family. She recently worked for for the charity Live Life Give Life as a trustee, a charity which is of great importance to her and enables her to be apart of the encouragement in talking about organ donation. 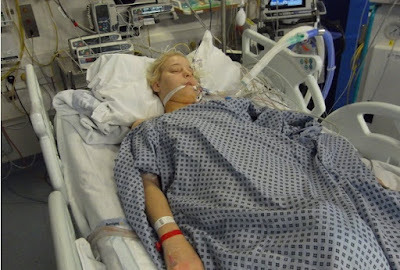 Kirstie's story and determination shines through her blog Kirstie-2ndchanceatlife as well as taking part in a short documentary on BBCThree, Love on the Transplant List (which is available through YouTube for you to watch). I'm really glad she has agreed to be apart of this week's instalment and hopefully enable more conversation to take place surrounding Organ Donation in the UK. 1. Kirstie, can you briefly introduce your condition pre-transplant? I was born with Cystic Fibrosis, it's a multi organ disease that clogs them up with thick sticky mucus. By the age of 21 my own lungs were damaged beyond repair by repeated infections caused by the mucus. I still have Cystic Fibrosis in all of my other organs, causing bowel problems, liver disease, diabetes to name a few. 2. What is the process of going on the transplant list? Is it a simple procedure to undertake? I had to be assessed over 3 days to see if I was still ill enough to need a transplant and well enough to survive. All my other organs were tested such as my heart and the extent of scaring on my lungs. 3. Did you have to wait for long for your transplant? Is there a specific waiting time or is it different for everybody? I waited only 3 1/2 months but this was because I became critical and was placed on life support, a device called ecmo and a ventilator. The average wait is 2 years for lungs. 4. When did you have your first transplant? Was it a speedy recovery? My first transplant was back in 2011, my recovery was extremely hard I had to learn to walk, talk and breathe on my own unaided from the ventilator, due to being on life support. It was hard. The whole experience was traumatic. 5. Sadly your first lungs weren't successful and your body rejected the lungs, does this happen often? Was it difficult to make the decision to try and undertake the procedure for a second time? Rejection is a part of transplant it was unfortunate I went through it so soon after my first transplant. The decision was not hard to go back on the waiting list, I didn't want to die. I only had a week, maybe two left in me. I will eventually reject these lungs and there will be no third transplant for me unfortunately. 6. It looks like everything seems to be going well with your lungs now. Is there an iconic moment in your recovery that sticks with you? There are a lot of moments that stick with me that make me realise just how well things are going and how lucky I am, Competing in my first competition for pole dancing was a real moment of happiness. Unfortunately I also worry a lot about rejection as anyone does with a transplant, I think maybe a little more as I've been through it. I also see friends suffering through it as well and that's the real struggle. 7. I know you blogged about your first transplant experience? What made you decide to do that? I wanted to raise awareness of organ donation, my blog went through my second transplant too and I occasionally update it now. I wanted people to know the real wait, what it was like with respiratory failure and not knowing if you were going to die. 8. Are you on the organ donor register yourself? Yes I have been since I was 13 years old. 9. Why is it important to you that people sign up to be a organ donor? It's important that we all take accountability in this life. We should be leaving the world a better place then we found it. Saving someone's life is one of the most precious gifts you can give. Everyone deserves a chance at life. 10. Do you have any advice for those who are undecided about joining the register? Simply think about if you would take an organ if you were to need one? Would you not want to give this gift as well? If you'd like to read more about Kirstie and her story you can find her on the links below. Thanks to Kirstie for giving her time to complete this interview and taking part in my week long feature for National Transplant Week.